geographical, cultural and political boundaries, this exhibition examines the physical and psychological relationships between individuals, races, history and environments. The concept also implies a circular act of gaze occurring between artists, artworks and their audiences, where visualisation, interpretation, and ambiguities are nourished. This exhibition examines the activity of observing; the projection of the self and consciousness; ones understanding of the outside world; and the seemingly definitive conclusions drawn from such acts of observing, projecting and understanding. Born in 1960 in Sichuan, China, Haili Sun has been working and living in the UK for over 20 years. 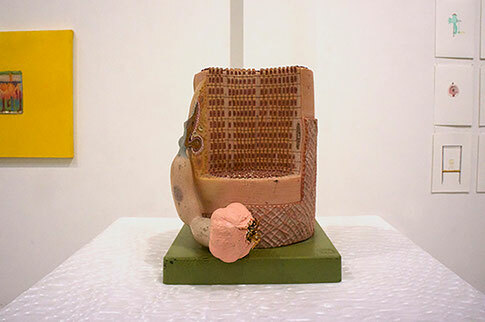 The artist seeks to explore artificial materials in order to ‘permeate’ natural materials or environment to gain a new experience in a visual and psychological way. In "Curled Fugue”， as the artist explained, a fugue is a polyphonic musical composition technique prevalent during the Baroque period. It is built on a theme which frequently repeats, and the term is derived from the Latin word meaning 'to chase' or 'to fly'. This musical form is transformed into a material form in this work, to deliver the effect of twisted emotions and the dilemmas of a changing environment. The 'border' is formed of the artist's travel tickets, postcards and maps. 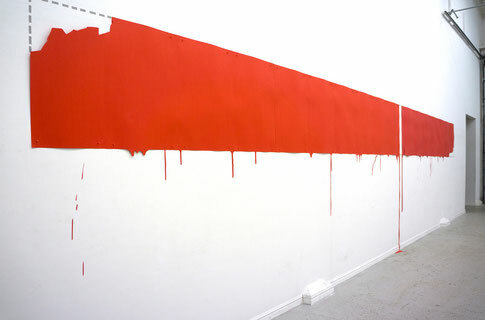 Whereas in the “Untitled",the artist mixed PVA glue and plant sap. This mix was used to making 'casts' of various parts of his body, creating a 'skin debris'. These 'casts' are collaged, restoring the whole body onto five broken glass. The artist attempts to explore the fragile physical and spirit struggling to break free, as well as the spiritual illusory. Born in the early 1960s , Yingsheng Yang has been living and working in UK for 30 years. Yang’s artistic attention has always been on how to combine Western contemporary ideas with his own cultural traditions. The exhibition display two works from him "invisible " and " the other side ". “ invisible” focused on a straight line drawn on a creased paper , then unfold the paper, It turns out in the middle part of straight line left a vacant slot still.
" The other side " is a site specific installation work, the window entrance from the space look alike a cabin window while symbolic human figure standing and yearning outside, It can be also seen from the outside by passers-by through all these windows to the interior space. Both in each other's other side. 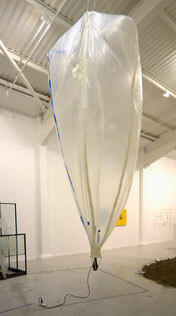 Born in the 60s, London based artist Le Guo who has lived and worked in UK for 26 years exhibited 2 installations for the show. A hugely ambitious work that boasts glass wool wrapped in black plastic tubes is installed by a petition facing the gallery entrance. 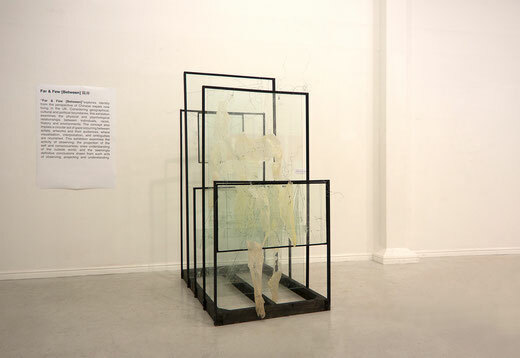 The body seems to sprawl out from the white wall whereas wrapped metal skeleton vaguely reflected spills of flashes from the sharp fine lines from the wound cotton silver metal.The work is named Koan means paradoxical anecdote or a riddle that has no solution; used in Zen Buddhism to show the inadequacy of logical reasoning. 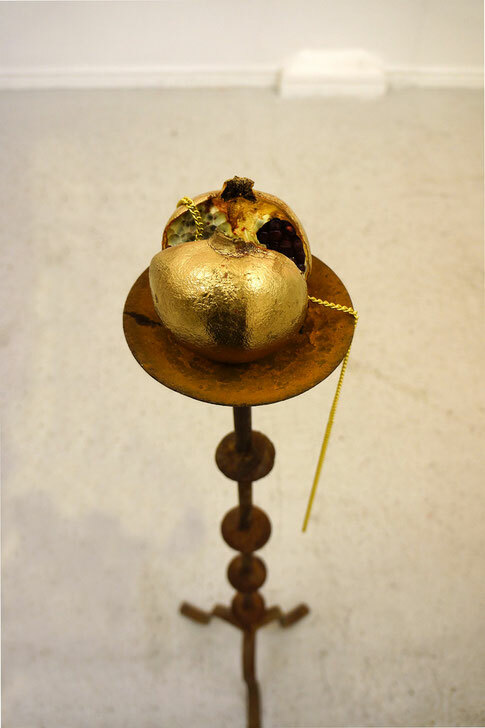 “Sacrifice” – the work presents a peeled gilt pomegranate as holy altar is monumentally placed on a rusty candlestick, by the time passing, the freshly dripping purple pomegranate starts to rot from inside and gilt shriveled appearance still remains intact on its own, a gold chain flow out, dangled in the wind.This altar candlestick was discarded by church and now left to return to its materiality itself. The pomegranate, as a metaphor of connecting Eastern and Western religions,is commonly used in different cultures has also been presented in the form of reality. Artist Jeremy Lee was born in late 70s, Beijing. After spending the childhood there, he moved to Hong Kong with his family. He has now lived and worked in London over a decade. Tian Mu has lived in London over 7 years. He often uses a narrative way with found objects which formed with reconstruction, rehabilitation and grafting. These actions originated in the artist's fascination with its collection of objects . They are removed from the basic functionality then become individuals and somehow vacuumed to be independent existence. The artist applied a series of re-creation, discuss self and the known in an elegant and witty way to explore such as the human identity and body reflection. Regarding fear in relation to his childhood incidents when fell into a ditch infested by insects. This leads to a conclusion where he expresses this concern of the dissolution of the boundaries between fiction and reality as a metaphor to seek living creatures and transmigration. 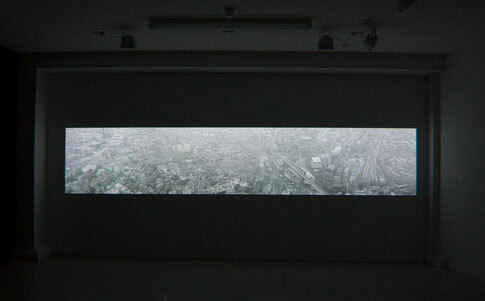 Born in the 80s, Lisa Chang Lee has been working in both London and Beijing for 4 years . Penetrated with the idea that ‘mentality is always ahead of languages ‘, Lisa Chang Lee’s work involves various mediums including moving images, sound, still images (printmaking, photography, drawing, etc.) to achieve an interactive stage of transmission between artist and the audiences. Whatsoever her work is always tactfully refined to be minimal and seemingly effortless. The intention anchors deeply to the oriental philosophy- the nothingness and harmlessness, revealing the artist’s perspective of individual existence, sensations, experience of time and space alternations. The exhibited work Habitat-1 stemmed from the artist’s experience of bird viewing a destination city while taxing. The duration of anxious and restless gaze seeking traces of familiar blocks,streets, buildings, windows, following a certain common formula of human habitat. The artist is intrigued by the contradiction between everyday experience in a city and being 'unplugged' then driven-off to see the machinery from above. The non-perspective landscape is reconstructed by numerous small frames. It becomes a patternized scroll of an organic body, whereas individuals are faded away from the scene like ants on the floor. Lin Yiman was born in 1990 to the south of China and has long been focused on living status of expats and multi-cultural realms in the age of globalization. 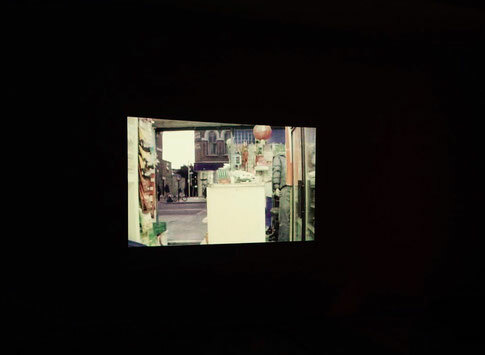 The exhibited video works "Fuxing Supermarket”, in the perspective of an objective lens, is located in a Chinese supermarket in London. Began with a scene filled with Oriental goods throughout the shelves, the camera was set objectively inside the shop. All of such are almost disorientating. Not until London's iconic red double-decker bus, mixed Chinese and English dialogues with western customers walking in and out, an viewer could finally reconnect to the place, which underlying an integration of conceptual base added to her international cultural identity. In contrast with the work "Habitat -1” allocated in the same room, Lin Yiman’s work looks at a city from a completely different angle. Instead of zooming out, the camera was zoomed into a micro cell of the machinery telling narratives of people by withdrawing cross－sections of reality.